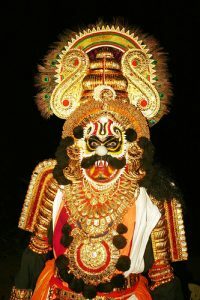 Since I’m in India, I thought I’d look into some of the local creatures of myth and legend that resonate with vampires…the lengths I go to for research. In fact, there are some who suggest the vampire myth actually originated in India. I didn’t find any solid sources for that, but it seems reasonable. Instead here are some of the creatures I did find. I couldn’t find a lot of information on Vetalas, other than that they are spirits that possess corpses. Once they possess the corpse, it stops decaying and they can use it to move around. As with many of these creatures, they were neither inherently good nor evil. They have inspired some great art. 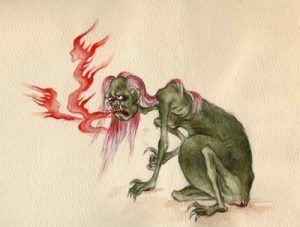 [They] are flesh-eating demons in Hindu mythology….Piśācas like darkness and traditionally are depicted as haunting cremation grounds… Piśācas have the power to assume different forms at will, and may also become invisible. I was intrigued by the description on another site, which unfortunately didn’t link to their sources, of their obsidian skin and bulging veins. If my book wasn’t already done, I might have had to go back and tweak the description of one of my creatures. This is another creature that has inspired art: the flesh-eating demon. This one looks kind of like an unmasked dementor. The Rakshasa, or female Rakshasi, are also called man-eaters. In common with a lot of these creatures, there were both good and evil Rakshasas. I find this interesting, since I have both good and evil ‘things that go bump in the night’ in my vampire novels. The description of these creatures definitely has echoes of vampires (or more likely, the tales of vampires echo these creatures). Often depicted with two fangs protruding from the top of the mouth and having sharp, claw-like fingernails, they could smell the scent of human flesh. They are also often depicted as being able to fly, vanish, and had Maya (magical powers of illusion), which enabled them to change size at will and assume the form of any creature…kind of like the bats in Dracula. Pretas were believed to have been people who were greedy or deceitful in a previous life, and come back with an insatiable hunger. That hunger is usually for something, um, untoward…feces, cadavers, and sometimes blood. As you go further east, these become the hungry ghosts of Chinese and Japanese myth. Generally, Pretas are seen as creatures to be pitied — they suffer constant torment of a hunger that can’t be satisfied or a thirst that can’t be quench. Unless of course, they thirst for human blood.